The infamous and storied Puttanesca sauce (Sugo alla Puttanesca), a simple and very tasty pasta sauce. The aromatic and spicy Puttanesca has become a favorite because of it’s balance of it’s flavors, there’s many stories as to the origins of this fragrant, spicy, bitter, sweet, and salty dish. Spaghetti alla Puttanesca literally translated means “whore’s-style spaghetti.” Many believe that the origins lie deep in southern Italy, most-likely near Naples in the Campania region, but it may also have roots deeper in Calabria and Sicily. It’s been said that some Neapolitans forgo the anchovies (but still include olives and capers) and that Sicilians might add green peppers. I find anchovies an essential ingredient and use a fresh hot pepper or some peperoncino fiocchi (hot pepper flakes). The Bitterness from the black olives, heat from the peperoncino fiocchi (hot pepper flakes), sweet tomatoes and saltiness from the anchovies make my mouth water every time. 1 can 28 oz plum tomatoes (preferably San Marzano), crush by hand. 1-2 fresh hot peppers or peperoncino fiocchi (hot pepper flakes) – spice is essential to a Puttanesca! 1. In a medium to large dutch oven, heat 3 tbsp olive oil and sauté the onions, garlic and crushed peperoncino fiocchi (hot pepper flakes) tn the hot oil. Cook for about 2-3 minutes (or so), waiting until the garlic begins to brown ans the onion turn slightly translucent. 2. Add the finely diced anchovies and cook until they begin to soften and break up. At this point, if you are going to add the tuna fish, it’s the best time to do it. Cook for about 5-minutes. 3. Add the capers and pitted olives, let cook for 3-5 minutes before adding the wine. 4. 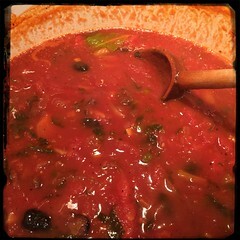 Once the wine comes to a simmer, cook for another 3-5 minutes and then add the crushed tomatoes. Cook for another 5 or 10 minutes or until the sauce begins to bubble. 5. Once the sauce is simmering and bubbling add the bay leaves. Let cook for 3-5 minutes before adding one cup of water. 6. Once the dance comes to a simmer again add some salt, pepper and the basil. Puttanesca is traditionally served over spaghetti with breadcrumbs instead of cheese.